In my search for a better HMI, I came across the Ego! Nowadays, just about all of the latest tech gadgets come equipped with an unwavering amount of useful features the likes of which include: music playback, data storage, Internet access, onboard cameras, games, GPS… the list goes on. As technological miniaturization continues to push the boundaries of what an electronic device is capable of, we might ask ourselves what more can the objects we come in contact with every day do for us. Let’s take our good ol’ trusty mouse, which keeps us productive and readily in control when we’re sitting at our computer. The simple technology doesn’t seem to fail. Though improvements have been made to traditional optical sensing mice — gaming mice with button customization and newfangled, touch-sensitive mice — what else is a mouse capable of? Much more, apparently. Laura Sapiens, an Italian design firm, is looking to internationally crowdsource their revolutionary take on the mouse that goes by the name Ego! Smartmouse.Laura Sapiens was founded a year after a group of engineers and software developers started work on the smartmouse. Now, two years into the project, the mouse has seen various improvements to its mechanical design, usability, hardware, and aesthetics. The Ego! 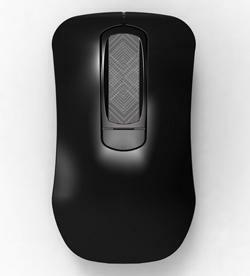 is like any other mouse in the sense that it utilizes optical sensing technology for tracking. But, that’s where most of the comparisons end. The Ego! offers users a unique interactive experience by providing 2D and 3D connectivity, hardware identity authentication, data storage and transfer (onboard and to the cloud), and the ability to seamlessly switch from one computer to another with the same mouse. With an onboard version of Linux OS running on a 400 MHz ARM9 microcontroller, the Ego! is offered at Flash memory capacities ranging from 2GB to 8GB. To enable its 3D features, an accelerometer, gyroscope, and compass are also thrown in. That’s not all. Add in a few LEDs used for notifications, a VGA camera for authentication, a Bluetooth chip for communication, a touch-sensitive surface for easy scrolling, and a vibration motor for kicks. All of this is powered by a rechargeable Lithium Polymer battery via micro-USB port. Though loaded with hardware, the folks at Laura Sapiens promise its battery life will last for hours thanks to the device’s ultra-low power consumption and energy-saving settings. Some additional software-related features include: quick device-pairing via smartmouse camera and onscreen QR code, automatic login and access to favorite websites, and immediate access to cloud account upon connection. To top it off, the Ego! can be used as a Wiimote-like device for gaming and remote controlled media playback. Now, how well will this work for CAD? Is Tesla's Model S the Best Ever?